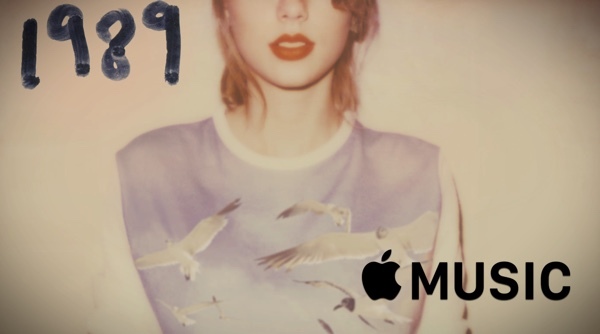 Multi Grammy Award winning artist Taylor Swift has decided to put her latest album “1989” up for streaming on Apple’s new music service when it launches later this month. You may remember that Taylor Swift had an issue with the fact that Apple planned on offering a three-month trial of its Apple Music streaming service when it launches on June 30, a trial that would have seen artists and content creators receive no payment for tracks streamed during that period. After effectively reversing on its stance, Apple has convinced Swift to do her own u-turn and allow her best-selling 1989 album to be offered to Apple Music subscribers. Apple’s plan to offer a free-of-charge three-month trial of Apple Music may have seemed unbelievably appealing and generous to end-users, but it hardly seemed fair to content creators and licence holders. During that free trial, those individuals and corporations who provided the content would not have received any payment for tracks streamed. Such is the influence of Taylor Swift in the music industry that Apple almost immediately reversed its stance and changed its Apple Music payment policies to state that licence holders would indeed be paid for content streamed during trial subscriptions. A series of tweets posted from Taylor Swift’s official Twitter account confirmed her change of heart. 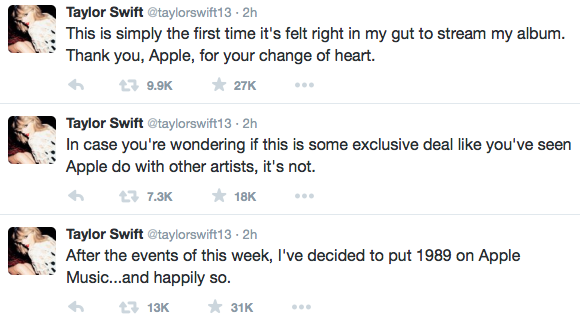 “After the events of this week, I’ve decided to put 1989 on Apple Music…and happily so” read the first tweet. Swift also confirmed that she hadn’t received any special endorsements or deals from the Cupertino giant to allow her album to be offered. “This is simply the first time it’s felt right in my gut to stream my album. Thank you, Apple, for your change of heart”. In addition to securing the rights to stream Swift’s 1989 best-seller, Apple has also signed up approximately 20,000 additional indie labels through a number of important deals. Apple Music is the company’s attempt at going head-to-head with services such as Spotify and Jay-Z’s Tidal in the music streaming arena. The service was announced as part of the WWDC 2015 opening keynote and will make its first appearance integrated within the native Music app when iOS 8.4 drops at the end of this month. In addition to streaming music, subscribers can listen to live constantly-on radio stations as well as connect with artists in a way that hasn’t previously been possible. Why am I not surprised? Nice publicity stunt there Taylor!